Combine different textures while maintaining a common theme for a seasonal look that is both complementary and contrasting. In this space, a braided jute basket adorned with pumpkins complements the hooked wool pillow, which happens to feature the same imagery as the doormat. The Black Crow Candelabra creates a 3-dimensional look brought out of the doormat and pillow, while the orange faux leaves and seagrass bench seats maintain the natural and warm feel. Is it ever too early to start decorating for a season or holiday? Maybe, but it’s never too early to start planning! Halloween is exactly two months away, and we are excited to showcase five of our Must-Have Halloween accents – some of which you can get away with displaying during the start of the fall season. 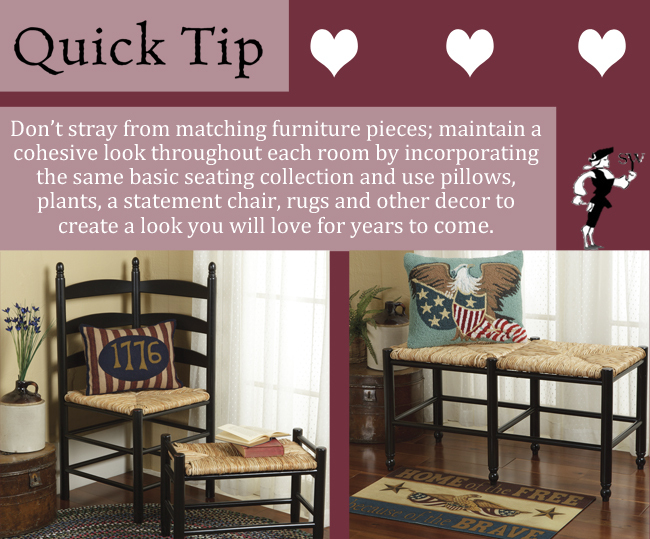 September does begin tomorrow, after all, so check them out and happy decorating! 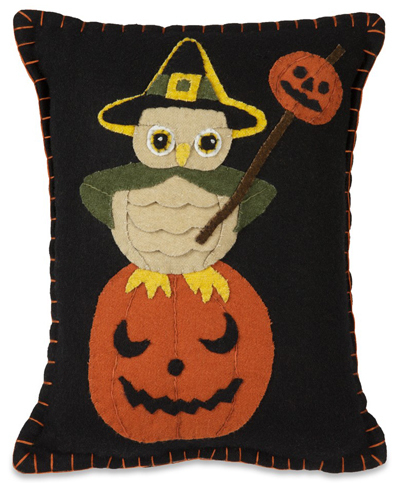 Owl imagery and accents are some of our favorites, and this Witchy Owl Pumpkin Pillow doesn’t disappoint. Artist Bethany Lowe handcrafted this wool and felt pillow, adding to the charm of the cute owl and smiling pumpkin. Perfect for smaller benches or a favorite sofa, this piece will make a charming addition to your fall décor, owl and bird décor, and finally your Halloween décor in the witchy hat and jack-o-lantern details. 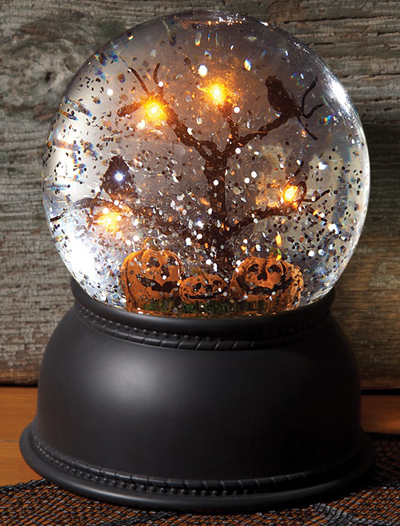 Spooky and enchanting are great themes for Halloween and fall decorating, and both fit the description of the glittery Halloween Snow Globe. A gentle shake floats the sparkly pieces down around a lighted black tree and pumpkins, creating a warm glow for a fall and Halloween centerpiece or mantel accent. 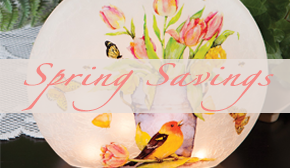 It also complements any snow globe collection and a variety of seasonal décor for a complete festive look. 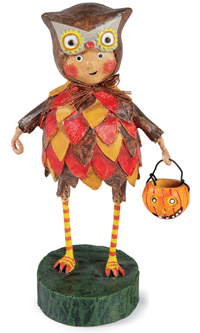 The bright plumage of Lori Mitchell’s Hoot ‘n Hollar Collectible is perfect for fall, and visibly ready for Halloween, making it one of the most cheerful accents for the season. 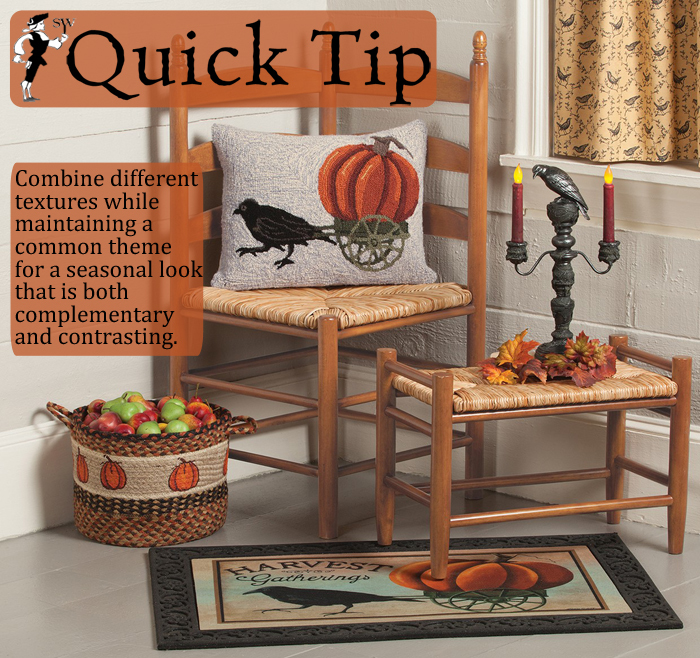 Place next to a candy dish on Halloween night or create a charming fall display on a hallway table by incorporating similar colors as this collectible for a complementing look that everyone will enjoy. This Sturbridge Yankee Workshop Exclusive accent will give any wall rustic charm through the distressed surface and ragged black streaks. 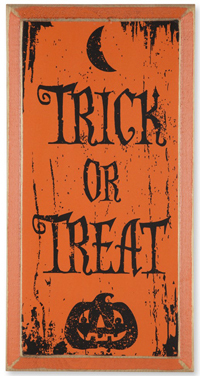 Even “Trick or Treat” is written in charming, slightly scrolled lettering to add a certain elegance while still portraying a spooky, Halloween look. The orange and black coordinate with classic autumn décor as well as your favorite Halloween pieces. Your front porch or entryway is a great place to go all out for decorating, since these are the first spaces your guests will view. Make the first impression positive, and just a little spooky, with the Polka Dot Boo Doormat. 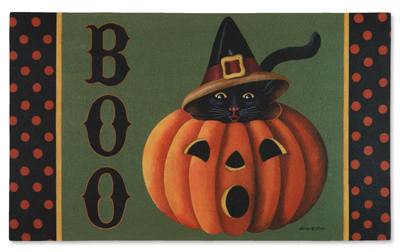 Playful polka dots line the edges of the mat and the pumpkin-black cat pair. The green background is a natural look that will highlight other autumn and Halloween greenery or leafy décor in the surrounding space, and you won’t have to deal with dirt being tracked through your home during the fall season.